Spring is the season for flowers, and The Flower Cottage & Gifts is here to help you spread the message! 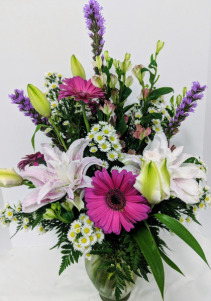 Pretty pastels flowing out of an elegant vase, bright bursts of color nestled in a basket fit for a bunny, or tranquil white flowers with the Easter season glow are all designs we can make just for you. Get some Spring Zing and Floral Freshness by ordering from The Flower Cottage & Gifts this season! NOTE: All containers, vases, flowers, etc. are subject to availability. Each order is made as close to the chosen item as possible. Specific orders and requests must be submitted at least 24 hours in advance. Share the Easter spirit with this parade of pastels and fresh blooms. 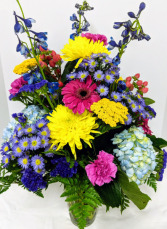 Feel the zing of spring with an arrangement full of bright, zesty colors in a mixture of blooms. Let The Flower Cottage & Gifts help remind you what spring is all about! 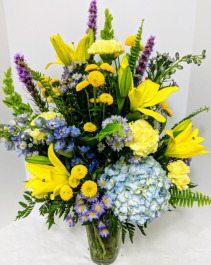 Yellow, Blue, Lavender Flowers, Vase. Send this springy mix to someone who could use a bit of pep in their step. 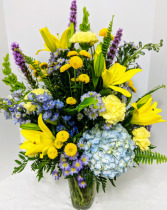 Our mix of bright yellows with blue and lavender pastels is sure to lift their spirits and brighten their day. 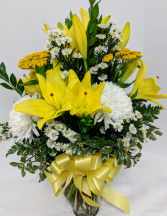 White & Yellow Flowers, Vase. Spring brings new life: new flowers, new babies, new love... 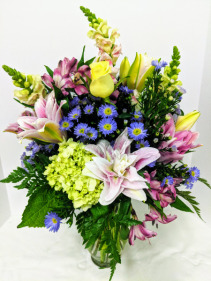 Celebrate this spring season with a fresh arrangement from The Flower Cottage & Gifts! 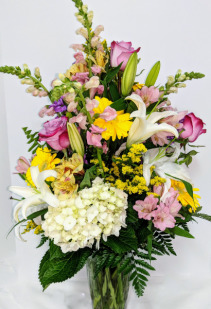 Pink, Lavender, White, Yellow Flowers, Vase. Fresh like spring, this arrangement feels like new beginnings. Bright yellows paired with pastel pinks, lavenders, and whites are what make these fresh florals sure to wow. Pink, Lavender, Blue, White Flowers, Vase. You know spring has suddenly arrived when there warm, crystal blue skies and flowers popping up in unexpected places. Send someone an unexpected breath of spring from The Flower Cottage & Gifts today! Pink, Purple, & Lavender Flowers, Vase. A luscious mix of lavender, purple, & pink flowers gives this arrangement a lively vibe. Great for a new baby, anniversary, or spring fling, these blooms are sure to lift spirits and make a statement. 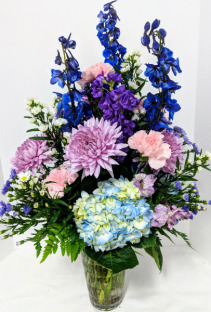 Blue, Pink, Yellow Flowers, Vase. Spring brings smiles because love is in the air, the days are growing longer, and warmer weather means flowers are all over. 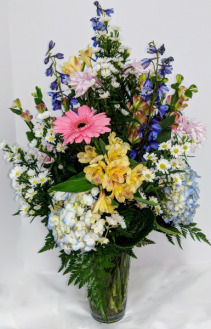 Give someone a smile by giving them flowers from The Flower Cottage & Gifts!